Have you ever wondered what happens when you format a server (or any Windows system) with a small bootable drive, and a large secondary drive? Why would you? It shouldn’t matter, right? Recently a client of mine discovered different, when he formatted a server and then discovered that the Paging File was placed on the D drive, because it had more room. If you try to use diskpart to clean a drive that holds the Paging File, it will fail. Oops. 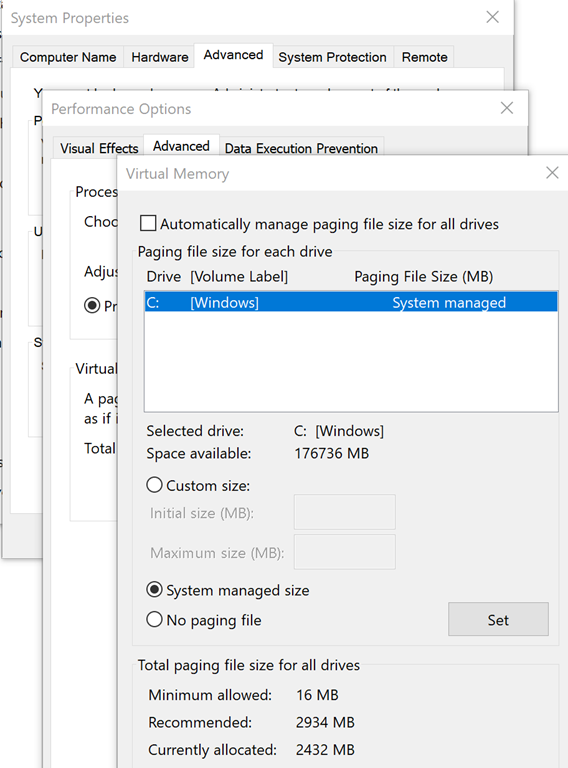 So, in Server with a GUI (or Desktop Experience, or whatever you want to call it) it is easy to open the Virtual Memory tab under Advanced System Properties and change the size, change where it sits, and so on. Great… but what if we want to modify these settings in Server Core? Or frankly, what if you have hundreds (or thousands) of systems that you want to configure? The answer is, as usual, Command Line (PowerShell can do it too I am sure… I haven’t looked). WMIC.exe is a command line tool that was developed to allow administrators to manage the Windows Management Instrumentation (WMI) from the command line (CLI). It does myriad things, but for our purposes, we are going to use it to modify the Page File. Step 1: See what you got! This will let you know where your page file is, and its usage. The screenshot below shows that my Microsoft Surface Pro 4 has a page file of 2432 MB. For a 16 GB laptop, that might be a little insufficient. Step 1: Modify what you got! The first step was to remove the automatic management. That’s done. So there it is… I ran these commands on my Surface Pro 4, and I should now have my 4-8 GB page file, right? Wrong. Anyone care to guess what is missing? When do page files change? Yes, a reboot is required. Success! I achieved my goals… and with a bit of research, so will you. Thanks to Microsoft MVP and fellow MCT Marcelo Sincic for reminding me the proper syntax!